As a host of teams hunt promotion from the Championship, one of the players who will surely be a Premier League player next season is Blackburn Rovers midfielder Bradley Dack. Blackburn are unlikely to be in the top flight. They instead look set for a season of consolidation in the second tier, but the 24-year old attacking midfielder is almost certain to be there without them. He’s been attracting interest from the very best clubs in the country, with West Ham United, Crystal Palace and Spurs amongst those coveting the skilful playmaker. Dack began his career with Gillingham, suitably impressing in a five-season stay at Preistfield to earn a £750,000 move to Blackburn Rovers. In his first season, he helped fire them to the Championship. He’s now in his second season at Ewood Park and has adapted quickly to the rigours of the Championship, providing goals and assists as Tony Mowbray’s side has settled into the middle of the pack. The former Celtic boss has intimated he’d like to see Dack remain at Ewood Park and there’s been talk of a new deal, but that would do the midfielder a disservice. He’s got composure and drive, something lacking in many players in the second tier and something highly sought after in the top flight. Greenwich-born Dack would surely favour a move to West Ham or Spurs but a revamped White Hart Lane would be the perfect place for him to continue his development. He only has to look at the success of the likes of Dele Alli and Harry Kane to see what an ambitious and talented young Englishman can do under Pochettino. Alli has quickly risen from League One to be an England regular and Kane has also developed under the manager with plenty of game time. If Dack is to move up – and he will – then he must move to a club who will give him the support and game time he needs to show his talents. He is a similar player to Alli in that he likes the ball at his feet and to watch the game unfold ahead of him, but he’s also comfortable as a second striker, arriving late into the box. This season he’s been playing behind Danny Graham for Blackburn, giving him the scope to play a similar role for Spurs. Indeed, he could be a long-term successor for Christian Eriksen. The transfer fee is certainly going to be a stumbling block. Blackburn are not going to accept anything less than £20m for the player they paid a fraction of that price for, but with West Brom prepared to pay that in the Championship, it’s a realistic figure. Rovers are not looking like they’re going to get promotion. They’re priced as wide as 25/1 in the latest Championship betting odds, but they could seriously improve those chances with a huge war-chest courtesy of a transfer fee. Spurs missed out on players in the January window, something they’re not likely to do this winter. With a Champions League assault still pending and the fight for a top four finish in full flow, they’re going to need to recruit decisive in January. They must make Dack their number one target. This entry was posted in Previous Posts and tagged Bradley Dack on 03/01/2019 by leighc10. Winners of the Europa League as recently as 2013, a perfect four-game start to the 2018/19 Premier League season has seen Chelsea’s stock rise after a poor 2017/18 campaign that saw thirteen league defeats. While the Europa League gives Chelsea a double shot of regaining their place in the Promised Land, the amount of respect Mauricio Sarri gives this competition remains to be seen. PAOK have only lost at home on two other occasions this calendar year. While that in itself is impressive to a finite degree, the fact that those home defeats to nil came against two of their peers in the top three indicates that there is a psychological block at inopportune times. Adding to the fact that Chelsea are three weeks fitter than PAOK, this should be a stroll in Thessaloniki. However, a full-strength starting XI, with the possible exception of Hazard and Alonso, is an absolute must. 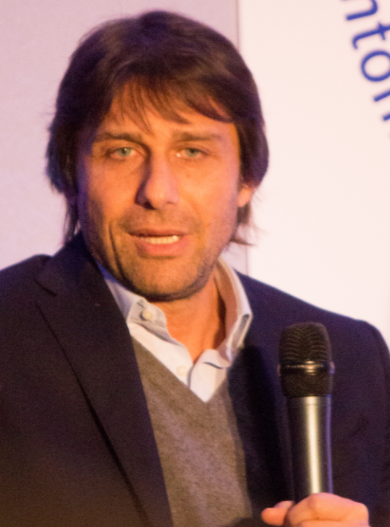 Chelsea win the Europa League in 2013. 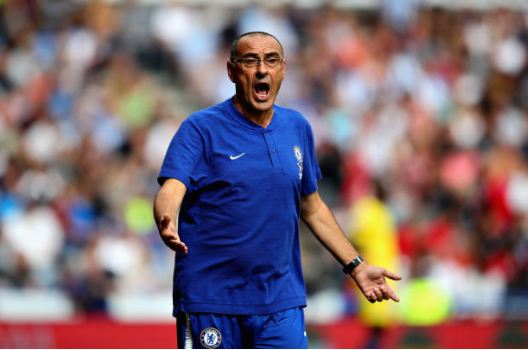 The fact that current football betting odds for the Europa League deem Chelsea as one of the Europa League frontrunners will add pressure on Sarri’s men, but it is nothing they aren’t accustomed to. 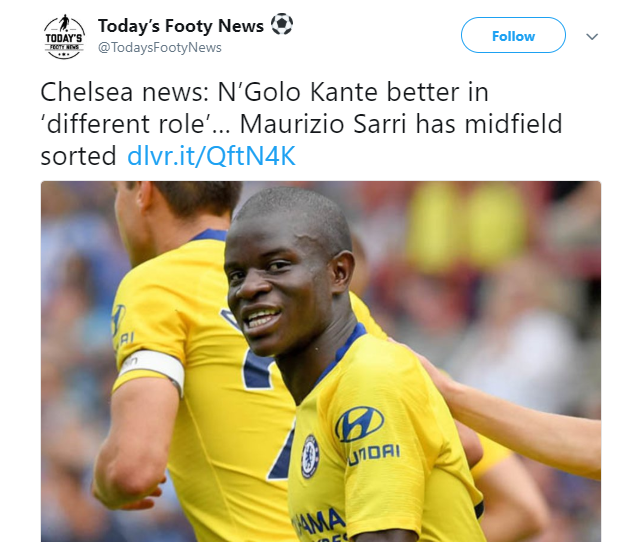 Yet, if Sarri truly does want his Chelsea side to flourish, and make good on their status as one of the outright favourites, then underestimating PAOK on the first matchday would be foolish in the extreme. PAOK were recent 4-1 losers at home to Benfica in the Champions League playoff round, but showed their credentials to take on stronger opposition, escaping the Estadio da Luz with a 1-1 draw in the first leg. One Chelsea player aiming to finally establish himself as a threat to the ultra-competitive Chelsea midfield is Ross Barkley. With the ex-Evertonian only ever completing 90 minutes for Chelsea in the Community Shield, the opening matchday is a personal ‘do or die’ scenario for the man who once made marauding runs and scored spectacular goals for his old club. With Sarri playing a 4-3-3 to good effect in the league thus far, Barkley’s natural role as a number ten is ill-fitted to the usual setup, and thus his true versatility as a professional could be tested to the limit in this Europa League match if he plays the full 90. The men from Thessaloniki will likely stay true to that which has worked. When faced with an in-form Chelsea side, dropping deep will do nothing. PAOK will be expected to attack and go for the first goal, while then shutting up shop and doing everything possible to hurt Chelsea. Greek top-flight games often throw up a much higher average number of red cards, and PAOK ending the night with ten men is a potentially shrewd outcome to back as desperation seeps in – as surely it will, whether PAOK are winning or losing in the latter stages. The hosts’ most dangerous player is unquestionably Vierinha, who was plying his trade in the Bundesliga – with a title-contending Wolfsburg – as recently as 2014. The Portuguese attacker’s ability to play off point striker Aleksandar Prijovic is one of several reasons that PAOK were able to finish second in the 2017-18 Greek Super League, and fall just six points shy of the club’s first title since 1985. 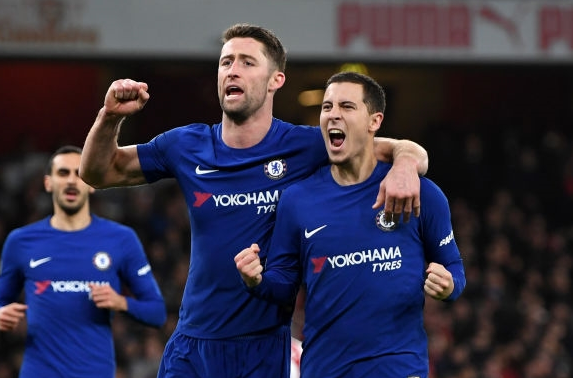 Prediction: We’re going for a straightforward 2-0 Chelsea win, with bet365 currently offering 15/4 on any winning margin of exactly two goals. This entry was posted in Previous Posts on 04/09/2018 by leighc10. 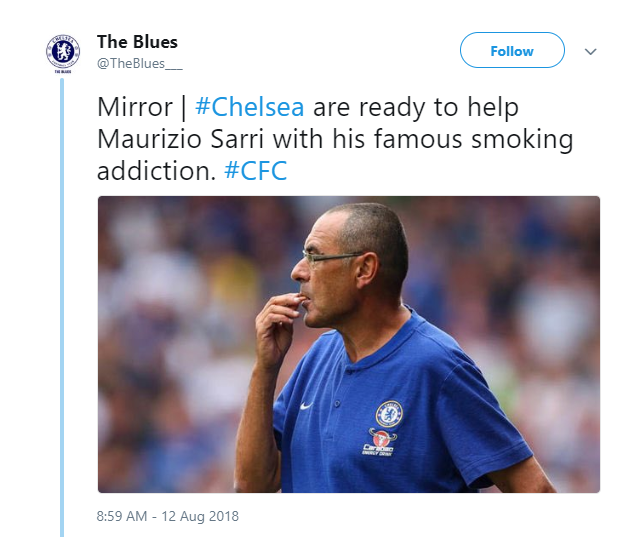 Sarri who joined from Italian Serie A big-guns Napoli in July. His reign didn’t start the way he had hoped, with the Blues beaten 2-0 by Manchester City in the Community Shield at Wembley. improve on last season’s bitterly disappointing fifth-place finish. 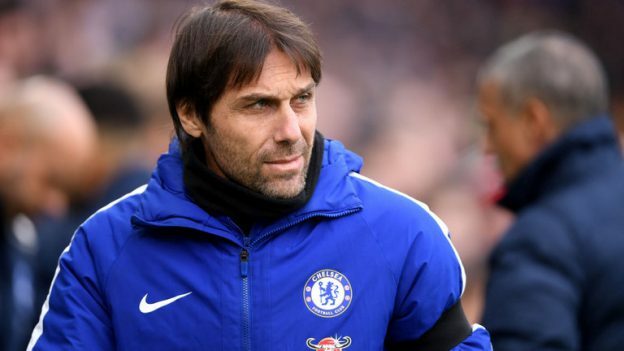 At least one year dealt out of the Champions League riches is a catastrophe for a club of Chelsea’s size but they’ll be planning to use the extra time on their schedule to put pressure on defending champions Man City. Huddersfield on week one of the schedule. from the penalty spot before the break, Marcos Alonso fouled in the box by Christopher Schindler. Easy street and by the time Pedro added a third 10 minutes from the end the game was long since over as a contest. staff to work on at their Surrey training base – but three of those four did hit the back of the net. a few fans scratching their head, but it also got them excited for the future. eight years – 2010, 2015 and 2017. Will 2019 be the year they add another medal? Such big odds is sure to attract the attention of club fans and punters on the lookout for value, eager to oppose Man City’s odds-on price with something a bit more interesting. top-four and that seems more likely. Qualification for the Champions League through a Premier League finish is 4/7 and that places them third in the pile behind The Cityzens and Liverpool who have been priced as close to guarantees as you’re likely to find at this early stage of the season. This entry was posted in Previous Posts on 16/08/2018 by leighc10. In 2017, Conor McGregor crossed over from his native sport of mixed martial arts in the UFC to fight the then 49-0 Floyd Mayweather Jr in a licensed boxing match. It was a much-hyped event that had people rushing to the bookmakers to back any chance that the Irish UFC world champion could defeat the undefeated American. The fight finished with Mayweather pacing his way to a composed victory over the exhausted McGregor in the tenth round. The media and advertising companies massively overhyped the event, but it did manage to peak the interests of sports fans not traditionally supporters of boxing or mixed martial arts. In the first month of 2018, two sports superstars have crossed over. Former UFC champion Ronda Rousey made her debut in the WWE, and eight-time Olympic gold medallist Usain Bolt has been trying out his football skills. The Jamaican speedster has been training with the Mamelodi Sundowns in South Africa and is set to have a trial with Borussia Dortmund. The crossover event into boxing was a cash-cow for Conor McGregor, and he took quite a beating, so there’s no wonder why he hasn’t stepped back into any combat sports just yet. In fact, his last legitimate fight was all the way back on 12th November 2016. Now his UFC division looks to be blocked off from him, so perhaps another familiar crossover is in the works. When it came to his first professional boxing match, Conor McGregor was – rightfully – the heavy underdog. But in the octagon, McGregor has been a heavy favourite to win almost all of his most recent fights, despite moving division. In his last fight, against Eddie Alvarez for the lightweight title, McGregor didn’t even need two rounds to stand victorious in the fight that the bookies favoured him to win. In the fast-moving world of the UFC, there’s now a newish, incredibly dangerous contender in the lightweight division. Khabib Nurmagomedov is set to fight Tony Ferguson on 7th April, and the Russian has already outlined his plans as the champion. Nurmagomedov is heavily favoured to win the fight at 2/5, so if you check out these UFC free Betting offers, he’d be a good use of the offer. If, or more likely when, Nurmagomedov does win, he would certainly give McGregor a run for his money in the betting odds, if he even lets him fight. 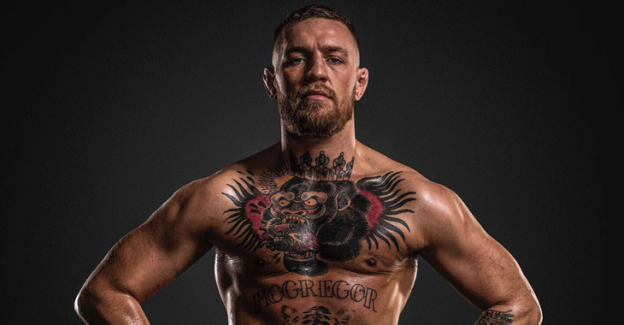 ‘The Eagle’ says that when he’s champion, he’ll fight those who have proven themselves to be real contenders in the division with win-streaks, rather than allow McGregor to suddenly get a title shot, again. If McGregor and Nurmagomedov were to meet in the octagon, it would be a tough call as to who would come out on top, and the Russian would certainly be able to upset the odds. McGregor made a huge amount of money from his boxing match and given his superstar status in the world of sport; other sports would certainly be willing to bring him in for a potential crossover. Going to the WWE seems like the natural progression for McGregor, but perhaps going back to his sporting roots would be the way forward. McGregor’s high-level of athleticism and natural talent in the sport could see him crossover in a similar way that Usain Bolt has been trying. Like Usain Bolt, McGregor is also a Manchester United fan. Right now, the Red Devils boast two players who did the opposite to McGregor and went from martial arts into professional football. Zlatan Ibrahimovic has a black belt in taekwondo – often showing off the skills that he developed in the discipline while striking the ball acrobatically – and Chris Smalling was a young judo champion. The most news that has been revealed about an upcoming fight for Conor McGregor is a video of Floyd Mayweather stepping into an octagon in a viral video. The hype has been about a comeback fight, but perhaps a crossover to football would be more lucrative knowing that he could walk back into the UFC whenever he wants. This entry was posted in Previous Posts on 09/02/2018 by leighc10. It is clear what Newcastle United’s problem is: they are simply not scoring enough goals. The Magpies have scored fewer than one goal a game in the Premier League so far this season, and for a team that gets over 50,000 fans for their home matches and are planning to break into the top ten in the coming years, it is simply not good enough. If Newcastle go down to the Championship at the end of the season – and they are only 4/1 to get relegated, according to the latest football betting odds – then the main reason would be their lack of goals. Which is why it comes as a massive surprise that Aleksandar Mitrovic has been sparingly used by manager Rafael Benitez so far this season. Mitrovic is one of the best players at Newcastle, and at 23, he is still very young and is only going to get better. The Serbia international striker has not made a single start in the Premier League so far this season, but he has still scored one goal in 89 minutes of league football. Last season, the 23-year-old scored four goals and provided six assists in 11 starts in the Championship. 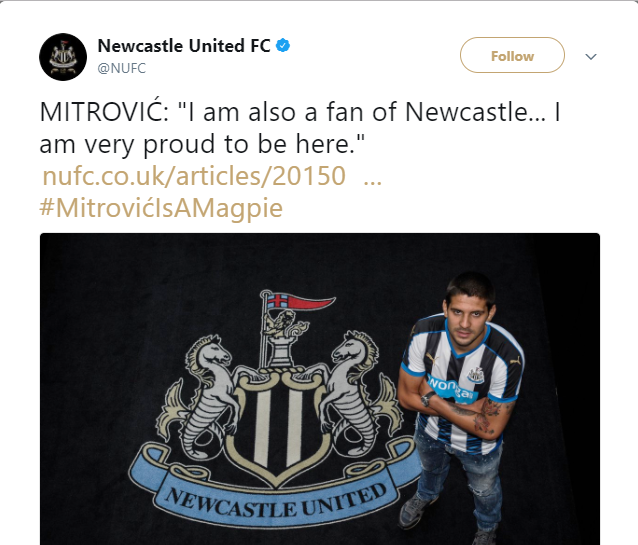 It is clear that Newcastle manager Benitez does not rate Mitrovic highly, and it would make sense for the striker to leave the Magpies in the January transfer window. After all, there is no point in the former Anderlecht star remaining at St. James’ Park and warming the substitutes’ bench week after week. Moreover, with Serbia set to feature at the 2018 World Cup finals in Russia next summer, Mitrovic has to be on top form in order to make an impact for his national team. 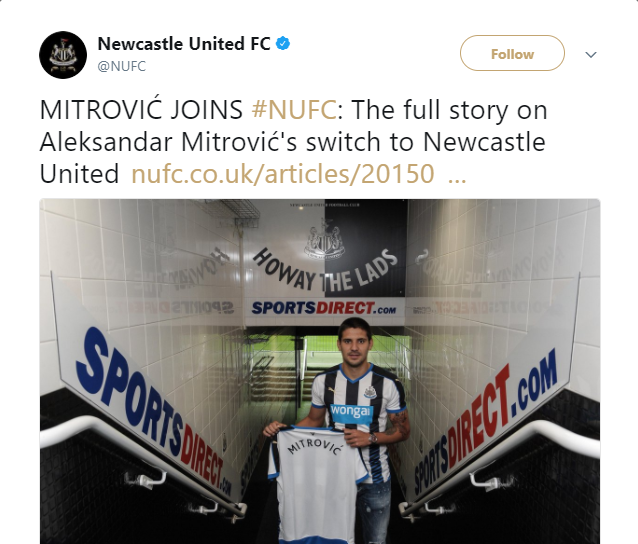 The Serbian has been linked with moves away from Newcastle in the January transfer window, with West Bromwich Albion reported to be interested in him. Of course, joining a club like the Baggies who could get relegated from the Premier League may not be ideal for Mitrovic, but he should jump at the chance of getting more playing time. The Serbia international is going nowhere playing for a manager who does not fancy him and for a club who are fighting for survival, and it would not be too bad of an idea to jump from the frying pan and into the fire if West Brom do make a move. Even if Mitrovic has to leave Newcastle on loan for the second half of the season, he should take the opportunity. A return to Anderlecht would be great for him, especially as he knows the Belgian club well and was a massive success during his time there. What the 23-year-old needs at this stage of his career is regular playing time and a manager who has confidence in him. Newcastle are not going to let him leave if they do get £13 million in transfer fees – the same amount they paid Anderlecht to sign him back in the summer of 2015 – and not many clubs would be willing to pay that much money for a player who is not playing much these days. This entry was posted in Previous Posts on 04/01/2018 by leighc10. 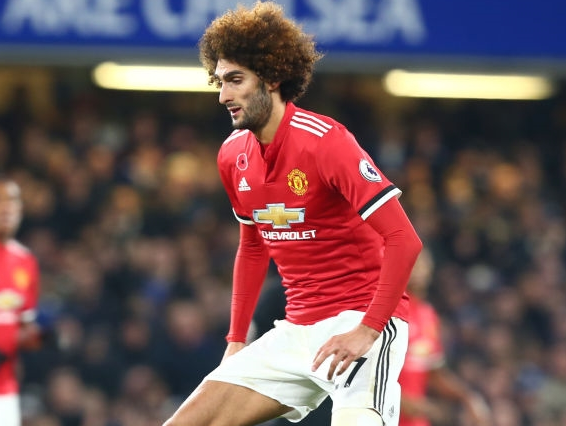 Manchester United player and Belgian attacker, Maraoune Fellaini has officially acknowledged for the very first time that he might not accept a Manchester United new deal, with the midfielder slowly running out of contract, which is set to expire at the end of the season. The Red Devils’ boss Jose Mourinho has previously made his intention to keep the Belgian midfielder very clear, and has advised the club’s board to give a new contract, in the hope to extend the attacker’s stay at Old Trafford. Fellaini, who currently earns £75,000-a-week, was offered £100,000-a-week by United, and was positive the Belgian would accept. Later in the week, the 30-year-old admitted that he had just rejected United’s offer and was hoping they would bring in a tempting offer shortly. Check out freebets.org for the best odds in the Premier League yet to come and cheap soccer cleats. Several clubs from Europe have been linked to get a signature from Fellaini, whose appearance for the Reds Devils was last month due to a knee injury he acquired. This entry was posted in Previous Posts on 27/12/2017 by leighc10.